The power wheelchair Permobil f5 Corpus VS allows user to enjoy face-to-face communication, greater pressure relief, and many other health benefits. Combining all of the features of the world renowned Corpus seating system with standing functionality, users will be able to stand and drive at any point of the stand sequence. At Orthopedic Service Company, we proudly provide our customers with access to one of the best mobility vehicles in the market. 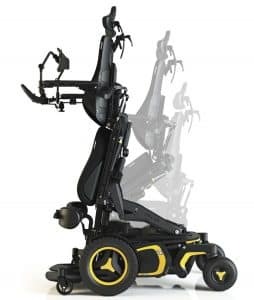 With features such as programmable power footplates and standing backrest angle adjustments, the F5 Corpus VS is designed to support all of the clinical, functional and lifestyle needs of active users. As a robust mobility vehicle, the power wheelchair Permobil F5 Corpus VS stands out with its durability, stability and power. Providing all of the benefits and functions of the ergonomically designed Corpus seat with an new innovative way of standing, users of the F5 Corpus VS can now choose between a sit-to-stand position or lay-to-stand. Its fully independent suspension and automatic, self adjusting support wheels provide comfort and stability under any driving circumstances, including outdoors. Non-joystick drivers can choose from a wide range of alternative driving controls, as well as separate controls for assistants or caregivers. Due to its powerful new motors, combined front wheel drive, and Enhanced Steering Performance (ESP), you’ll be able to go wherever you want to go without sacrificing speed or freedom of movement. Contact Orthopedic Service Company today and talk directly to one of our mobility specialists. They’ll guide you through all of the mobility vehicles available at our showroom and help you find the perfect match that fits your lifestyle and specific needs. Give us a call or visit us today!